Losing weight can be a tough feat and even tougher if you’re battling depression. That’s when Deirdra985 took matters into her own hands by prescribing herself an exercise plan. 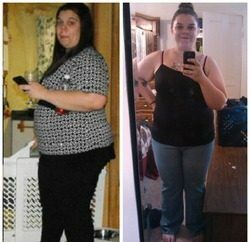 She has gone from a size 22 to a size 10 after losing 75lbs. I was really depressed for a couple of weeks with no end in sight. I’d heard that exercising released endorphins, so I ran out to the gym and joined. I began taking classes 5 days per week for about a month. I moved across country and when I got here I realized that my clothes were all very loose. I thought to myself, “Wow, I bet if I start watching what I eat I can lose even more weight” and so I did. I continued working out 5-6 days per week and eating very healthy. So far I have lost 75 pounds (although 3 have come back because I was away from the gym for a week and a half) and I keep pushing on. It’s very difficult for me because I hate exercise and I love food. While it’s coming off much slower now, I have gone from a 22 to a 10 and I’m thrilled with the results! None. I was always very comfortable in my own skin. I was raised with the notion that it’s what’s on the inside that counts and I have always looked at myself, as well as others, that way. 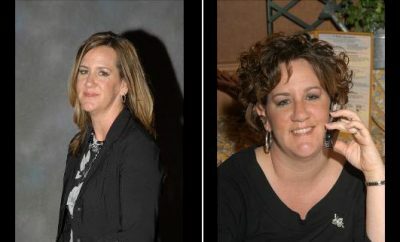 RELATED: Weight Loss Before and After: I Lost 220 Pounds Forever! I went from no exercise what so ever to doing 4 miles a day on the elliptical at a high incline and a high resistance. I upped my game by doing some weight training every other day and that seemed to help when I had “plateaued”. As for food, I changed just about everything. All of the foods that I love are now special treats and I have them every so often. I don’t deprive myself of anything entirely; I just save them for when I’m wanting them most or a special occasion. I really only ever read the newsletters but I have signed on to track exercise and food intake and I have high hopes that it will help me lose faster than I have been as of late. Getting up at 4am every day to go to the gym is definitely the worst part. One month before I realized that my self-prescription for depression was also making me shrink. When I reached a size 10 from a 22. I make myself go to the gym each day because I’m of the mindset that if I skip just one day (other than Sunday) I will think it’s “OK” to skip other days. At which point I can see myself slacking and subsequently telling myself it’s OK to eat junk all the time, too. So, I guess, I just nip it in the bud. Sadly, I’m more accepted by and welcomed from people (strangers). It makes me so sad to see just how shallow we are as a race. 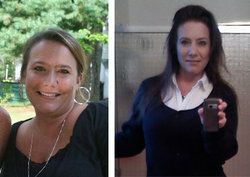 I’m the same person I was before, only thinner and healthier. Exercise almost daily. I mean sweat, not just a walk around the neighborhood. Cut out whites. Whole grain breads, pastas, crackers, etc. It’s OK to eat carbs, just make sure they’re in the form of grains/wheats. Never deprive yourself of anything entirely. You’re sure to fall off the wagon that way. Have a “goal treat”. When I reach my goal, you can be sure I’m going to sit down with a Reece’s Peanut Butter Cup and bask in all of its glory!